The Cowboys wide receiver surprised fans by releasing a hip-hop album. A bigger surprise? His work with the mic ain't bad. It’s May 12 and the release party for the debut album from Dallas’ hottest new rapper is happening at Lava Cantina in The Colony, a new restaurant and outdoor concert stage located in a still-under-construction development adjacent to State Highway 121. It is an unusual setting for a party celebrating a record that hit No. 11 on the iTunes charts earlier in the day. Lava Cantina is one of a number of new music venues that are sprouting up on the outer highway rings of North Texas, targeting suburban-dwelling middle-aged couples who can tuck in their kids with babysitters and head down the road to catch AC/DC cover bands or nostalgia acts like Kid ’n Play or Winger. Sure enough, this album release party also contains an aspect of sideshow novelty: the new rapper with the hit album is Cole Beasley, a wide receiver for the Dallas Cowboys. Like his NFL career, Beasley’s album came out of nowhere. The soft-spoken, small-statured SMU graduate, who has enjoyed six up-and-down seasons with the Cowboys, says he has been rapping since high school, but he didn’t go public with his talent until January. His first full-length album, The Autobiography, dropped in May, and a ricochet of tweets by his teammates helped propel it to fame. If Beasley’s album was unexpected, it is not unprecedented. There is a tiny appendix to the history of popular music dedicated to sports stars who attempt musical crossovers. Shaq, Chris Webber, Delonte West, and Kobe Bryant all dabbled in hip-hop. At the height of the Cowboys’ 1990s success, Deion Sanders released a song called “Prime Time Keeps on Ticking” and filmed a video in MC Hammer’s house. As a sub-genre, athlete-made music demonstrates how much crossover there is between musical and athletic peacock strutting. What makes Beasley’s album a curious addition to the canon is that his music doesn’t strut—it ponders. Beasley raps about growing up on the streets of Little Elm, eking out a career as a workhorse in the NFL, how much he loves his wife, and his fear and paranoia that someone may harm his family while he is away with the team. One song, “United Hate of America,” avoids politics to criticize internet trolls. In “80 Stings,” Beasley brags about not spending his NFL money on gold chains, but rather putting it away for college funds for his two children. Substitute Cowboys games for business trips, the gym for the office, and Beasley’s Autobiography reads like the struggles and stresses of living a successful life in Collin County. Cole Beasley’s album is different precisely because he hasn’t won a Super Bowl. In fact, the album’s origin story begins in 2015, during one of the worst Cowboys seasons in recent memory. That year, Dez Bryant broke his foot, Tony Romo broke his collarbone, and the Cowboys went 2–12 in their final 14 games. 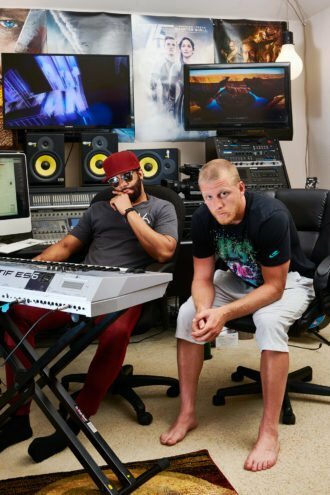 Instead of going to clubs or making public appearances, several players spent their off-time hidden away in the Plano studio of producer Victor “Phazz” Clark. Phazz was introduced to Cowboys safety J.J. Wilcox through former Cowboy Greg Ellis. Phazz, in turn, had met Ellis through their mutual friend Rowdy, the Cowboys mascot, at an event where Rowdy was trying out a new raccoon mascot character. But that’s a story for another day. Wilcox played keyboards and liked making beats. When the tracks Wilcox and Phazz produced together began to play in the Cowboys locker room, other players, like Jeremy Mincey, Greg Hardy, and Morris Claiborne, wanted in. Phazz’s home studio soon became something of a Cowboys clubhouse. Beasley was late to the game, but on his own time, he was already trying to learn how to make music, teaching himself how to use the recording software Pro Tools by watching YouTube videos. When he heard that his teammates were hanging out with a guy who had a home studio, he saw it as an opportunity to learn more about recording. Beasley played Phazz some of the raps he’d recorded on his phone; Phazz was impressed. Beasley became one of Phazz’s most dedicated athlete-students, finding time for music at the end of long workdays. After practice and the gym, spending time with his wife and putting his kids to bed, Beasley would steal away to the computer and work on lyrics. The result is an album Beasley can be proud of. He definitely has talent. At his best, Beasley’s raps flow in rapid-fire streams with billowing, complicated rhythms that slide in and around Phazz’s well-produced tracks. Beasley has managed to create a collection of songs that express something of his sincerity and seriousness, with more than a hint of the single-minded determination that helped propel the humble SMU underdog into a career with America’s Team. Which isn’t to say Beasley is the second coming of Eminem. For all the album’s merits, the lyrics can be stilted and inconsistent, and Beasley’s delivery can be choppy at times. In other words, don’t expect Cole Beasley to headline the Super Bowl halftime show anytime soon. Not that he wants to. I find Beasley in the VIP balcony at his record release party at Lava Cantina, and he tells me that he has no desire to perform or tour. Music will remain a side passion. “I will play football until my wheels come off,” he says. After our conversation, Beasley floats back into the crowd of VIPs. Dak Prescott, in an FC Dallas jersey with his No. 4 on the back, is pressed up against the edge of a balcony watching a white female rapper from Florida perform onstage. Off the side of the stage, you can see the cars whizzing by on 121 and the quiet skeletons of half-built big box stores glowing in a golden dusk. Zeke Elliott arrives and moves through the crowd with the slow, deliberate gait of someone who is used to being the main gravitational force in a room. Beasley greets his guest, and they embrace. Even though a wide-mouthed gaggle of teenagers presses up against the railing of the VIP section, snapping photos with their phones, the setting at Lava Cantina diffuses something of the aura of celebrity surrounding the athletes. Members of the team sit around circular bar tables cracking jokes or scanning the crowd. Their wives and girlfriends pair off to the side, swiping at their phones, looking bored. The scene resembles something like a high school football team’s reunion, not a banging Saturday night out with Dallas’ biggest celebrities. Which is appropriate. After all, they are here to celebrate their little friend Beasley, who, when handed the mic, chooses not to brag about his success and celebrity, but to tell you about the difficulties and loneliness of living on the outskirts of superstardom.